Babesia infection or babesiosis refers to infection with a protozoal parasite from the species Babesia.Merozoites or piroplasms are the stage of Babesia that invades mammalian red blood cells, causing anemia. Babesia species are found worldwide, although in North America, most canine cases of babesiosis occur in the southern United States. Pockets of the disease also exist in Massachusetts, Pennsylvania, and New Jersey. How does a dog contract babesiosis? 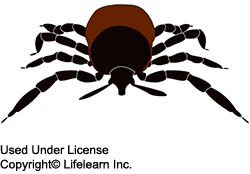 Babesiosis is spread through the bite of an infected tick (primarily from species of Ixodes, although other tick species may also be capable of transmitting the disease). 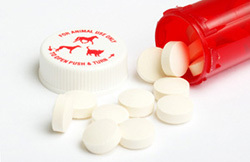 There is also evidence that some direct animal-to-animal transmission may occur, such as when an infected dog with oral lesions or abrasions bites another dog. Recent studies show that Babesiamay be transmitted transplacentally (to unborn puppies in the uterus). Dogs housed in kennel settings with poor tick control are at a higher risk for developing babesiosis. What are the clinical signs of babesiosis? Dogs infected with babesiosis may present with a wide variety of clinical signs, ranging in severity from a sudden collapse with systemic shock, to a hemolytic crisis, to an insidious and slowly progressing infection with no apparent clinical signs. Dogs typically present with the acute, severe form of babesiosis, which is characterized by findings such as abnormally dark urine, fever, weakness, pale mucous membranes, depression, lymphadenopathy (swollen lymph nodes), and an enlarged spleen. 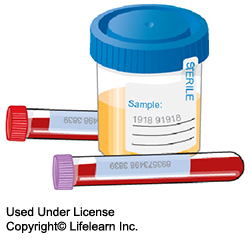 Blood and urine tests may show anemia, thrombocytopenia (low platelets), hypoalbuminemia (low albumin, a blood protein), and bilirubinuria. In the past, babesiosis was diagnosed by demonstrating the parasite on a blood smear. Other diagnostic tests are becoming more readily available, including FA (fluorescent antibody) staining of the organism and ELISA (Enzyme Linked Immunosorbent Assay) tests (currently available only for B. canis). A polymerase chain reaction (PCR) test is also available. Serologic or titer testing in the diagnosis of babesiosis has limitations. A positive test result is dependent on an antibody response by the infected dog, which may take up to ten days to develop. Once a dog has developed antibodies to babesiosis, they may persist for years and this must be considered when performing follow-up tests. The FDA approved treatment for babesiosis isimidocarb diproprionate. Other treatments include atovaquone (Mepron®) and azithromycin (Zithromax®). These newer treatments may help eliminate the sub-clinical carrier states. Your veterinarian will discuss any alternative and adjunctive treatments with you. What is the prognosis for a dog diagnosed with babesiosis? "The prognosis for a dog diagnosed with babesiosis is guarded. Owners should be aware that dogs that have survived babesiosis often remain sub-clinically infected." The prognosis for a dog diagnosed with babesiosis is guarded. Owners should be aware that dogs that have survived babesiosis often remain sub-clinically infected. These dogs may suffer a relapse of disease in the future or may serve as a source for the further spread of disease in a given area. Dogs that have recovered from babesiosis should never be used as donors for blood transfusions because the recipients may develop the disease. Currently, an effective vaccine is not commercially available to protect dogs against babesiosis.